A month or two ago, José discovered my little secret while browsing the photos on my phone and he was like a little kid opening presents on Christmas. Now he’s always stealing my phone when he’s hungry! 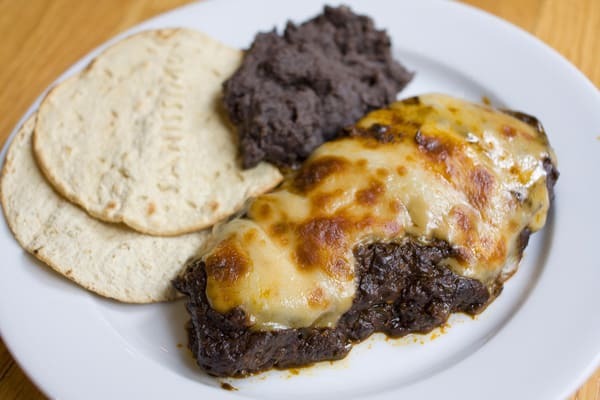 Last week he was scrolling through the recipes looking for something different that I hadn’t yet attempted to make and he came across this recipe for filete de res a la Chiapaneca, or Chiapas-style steak. It’s another recipe of Tía Carola’s and it came with minimal instructions as usual. I had to modify the recipe slightly because on the first taste test of the salsa, José said it didn’t taste quite right. But this version I’m sharing here is super sabroso and sure to delight the whole family. Blister the tomatillos on a hot comal until they have a few black spots and are slightly charred. Take the stems off the chiles. Open half of the chiles and remove the seeds and the veins. 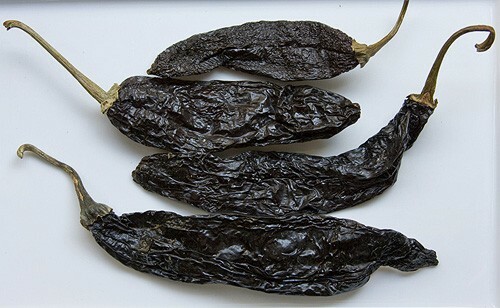 The veins contain capsaicin, which is what makes chiles spicy. This salsa should not be too hot, so that’s why we’re going to remove half the heat. Then roast the garlic and the chiles on the hot comal. Be careful not to burn the chiles. They should inflate slightly while they’re roasting but you don’t want them to turn black. About 20 seconds or less on the hot comal should suffice. Put everything into the blender and puree until smooth. Coat the bottom of a large deep saucepan and heat it until the oil is hot, but not so hot that it starts to splatter. Gently pour the contents of the blender into the pan with the oil and fry the salsa over medium heat, stirring it until it starts to turn color and thicken a bit. Butterfly the filets and sprinkle with a bit of salt and pepper to taste on each side. Grill or pan-cook them until they’re done to your satisfaction. We like them medium-rare, but you can cook them until they’re well done if that’s how you like your steak. Place the steaks on a baking sheet or in a jellyroll pan. Queso Oaxaca comes in a ball shape most often and is similar to string cheese in consistency. It is sometimes sold in Mexican grocery stores already unraveled and on a styrofoam deli tray, covered with shrinkwrap. I prefer to buy brands that I have seen in Mexico such as Fud but really any brand works fine. Generously spoon the salsa over the steak and then cover with some of the cheese that you’ve pulled apart to create a cap over the salsa. Place the baking sheet or pan full of the steaks under the broiler in the oven and broil until the cheese is bubbly and has some brown spots. Serve with warm refried black beans and totopos (hearty tortilla chips) or picaditas (like little tostadas). Have you ever had comida Chiapaneca? What’s your favorite food from Chiapas? This looks like something I could handle and would totally surprise Alan!! WooHoo! !